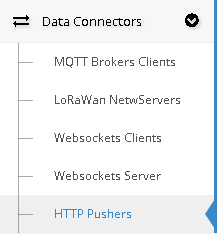 Definition A HTTP Pusher is used to forward all communication received from your connectors to a url of your choice. You can eventually filter the type of communication you want to send to the url. The sent data is a JSON of the same format as the one used in the [websocket communication]. The post field that contains the JSON is "data". Here's a php file that handles the http pusher calls and logs them in the 'pusherlog.txt' file.